The author smiling through pain, pride and so freaking much emotion. 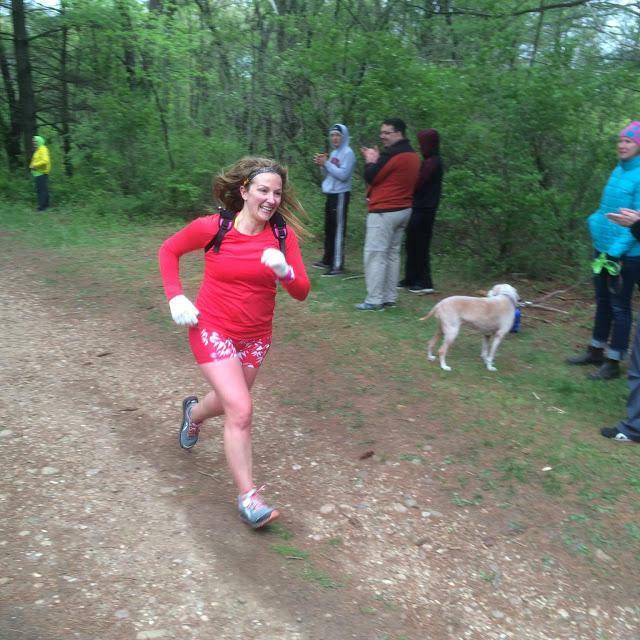 “Do an ultra,” they said, “it will be fun!” On Saturday, May 14, 2016 at the Ice Age Trail 50 Mile, they were right. And wrong. And then right, and wrong, and finally, right. I had run one ultra before, the Run of the Dead Elimination Run in November 2015. It was glorious, and I took the easy way out and avoided the hill challenge because I’m “smart.” Though around 9 a.m. this past Saturday, I wished I had spent the past six months running only that hill. I also find myself now saying things like “Run of the Dead was great and only 34 miles.” Only! I did not camp. I’m of the 1989 Troop Beverly Hills era where I believe a Holiday Inn is as close to camping as people should get. This does not mean I am not outdoorsy. It means I believe flushing toilets are one of the best inventions ever. In fact, did you know that Thomas Crapper manufactured one of the original successful lines of flushing toilets? He didn’t technically invent the toilet, but for the love of God his last name is Crapper, so let’s go with it. Two nights before the race I canceled my hotel stay because I couldn’t justify paying for what I was sure would be a miserable night of sleep anyway. At 3 a.m. when I rose for the day because I knew sleep had abandoned me, I thought about all the things I would instead spend that $127 on that day. Hopefully on celebratory Ice Age paraphernalia. I couldn’t believe how smooth it was to get into the parking lot and get situated. I also couldn’t believe how many of the other cars on the road were headed to the exact same place. It was 4:15 in the morning on a Saturday, but it was rather calming to see every car in front and behind us turn into the same lot. You would think 450 people moving into one lot at that time would cause anarchy, but it was the smoothest part of my day. Advice #1: If you decide to pack a drop bag, please make sure to check what tarp you put it on. I spent so much time scrutinizing the mileage on each drop tarp and debating when I would really want my backup shoes, jacket, socks, shorts, aspirin, that I failed to notice my final selection was a 50k tarp. K, not M.
It was cold and we were huddled together waiting for the race to begin. It was not cold the moment the National Anthem began. As is it always does, the Anthem gave me a warm, fuzzy feeling inside. First, it’s the Anthem. It immediately brings me a sense of gratitude for those who fought so I can do pretty much whatever I want, including run. Not all people, especially women, are given the privilege of paying money to run 50 miles. Second, I envy anyone who can sing. I cannot, though that doesn’t stop me from trying. Thirdly, that means it’s race time. The Anthem soothes my nerves and calms me down which is ideal, because I was not out to win Ice Age in the typical way of thinking. I was going to win in that I wasn’t going to quit. For me that counts as a win. I think there was a starting gun, but I don’t know. As a sturdier runner, I was concerned about clock time versus chip time, and all I knew is that when the clock started, I was running. Apparently many other runners shared my goal of walking the up-hills and running the rest. Everyone took off and then stopped, like in any other race, but this time not because of a narrowing of path, but because we had already encountered the first hill. It would be easier to point out the times we were not going up or down a hill. Here they are in order: never. I learned a lot on the first nine-mile loop. It is amazing how many people sign up with someone, and I loved being right behind or in front of those people and listening to them talk and their stories. Those that don’t have anyone crazy enough to register with them (like me) are usually pretty willing to talk to anyone within a 10-foot radius (also me). One person who barely made the cutoff time last year taught me a lot about the free alcohol at mile 40, of which I had known nothing until that conversation. I was pretty excited to hear that, which tells you how unprepared I was for what was to come. I also learned that there is such a thing as “too much Body Glide” because my poor shorts had nothing left to hold on to since my entire lower half was covered in Body Glide. I’m terrified of chafing. I told myself it wouldn’t matter because I could change shorts if need be when I got to my drop bag. For information on why this might be a problem, see Advice #1. When we circled back past the start line I couldn’t believe how many people were there. It was almost awkward how quiet they got as I ran up the hill to that aid station. I still don’t know why, though I am wondering if I already looked like I was dying by that point. Maybe they were amazed at how much my shorts were moving. Maybe they were amazed that my legs were nearly the same colors as my red and white clothing. Maybe they were all runners awaiting the start of the 50k (hey, I know where your drop tarps are!) and were nervous and out of energy to cheer. Maybe they did cheer and I was so focused that I didn’t hear them. It doesn’t matter now, but it stands out in my mind partly because every other place I passed that day had people cheering. As is part of my fear about camping, I am not good at maps while moving. I like maps, I love working them out, I am not good at knowing which way is North unless it’s about 7am or 7pm or we’re within 500 feet of my home. Therefore, the term “Confusion Corner” had me pretty scared. I’m sure for those who are faster than me (see: most) this is very confusing because there are runners going different directions at that point. When you’re confidently bringing up the rear, it is less confusing because there is only one direction the sentries can assume someone of your stature is going. That adorable family, who looked like they were freezing, cheered loudly and then pointed me in the correct direction. It should also be noted I had printed out a map. It was in my drop bag. There are a few things that I cannot communicate about Saturday. One is how beautiful the course is. I enjoyed that no one had their phones out or were taking pictures because people are there to push themselves and enjoy where they are. I took only two pictures that day. That’s a big deal for me. I also cannot explain how nice everyone is. Everyone. I didn’t have a negative experience with one runner, and given that a good amount of this is single track, or so steep that there is only one safe path, that says a lot. You have to shimmy past people like you’re a college kid in a bar at certain points, and if we’re honest, no one smells good. Yet everyone is kind about it. And when someone falls or trips or whacks their toe on the largest roots I’ve ever seen in my life, multiple people offer help. I saw people sharing BioFreeze. Advice #2: Do not Google the difference between “hills” and “mountains” because it’s a lie. Those hills are mountains; I do not care what Wikipedia says. At one point my kids were apparently telling my husband how cool it was to drive up the roads they were on, and as he was conveying this to me after the race, I pointed out that not only was I running them, I was higher up than he was. On this loop I passed where my bag “should” have been if I weren’t a moron. I spent about five minutes looking for it and I think about that five minutes a lot, almost as much as I think about the five minutes I spent the next time through and the time after that I checked another aid station—15 minutes total. It breaks my heart (but it all ends well, I promise). The second time through that aid station (you’re supposed to go past it twice, I wasn’t lost) I now had a friend whom I actually knew before the race, not one I had met during the race. I was amazed at how confident I felt simply having another human I knew near me. Mark is a veteran and does a lot for Team RWB and it’s hard not to feel good about your chances when he’s next to you. I had started to make deals with myself in my mind like “If you can just get to mile 40 by nine hours, that gives you three hours to go the last ten miles.” I realize that might sound preposterous, but ten miles after 40 on that course is hard. And while you might think a 20-minute mile is beyond achievable—I do math for a living. If I’m walking up these mountains at a 30-minute pace, that means I have to run down them at a 10-minute pace to average out, or something like that. In my sturdy opinion, the only way to get down them at that pace is by somersaulting, which I nearly did. Advice #3: Don’t say sentences that begin with “If I fall,” say sentences that begin with “When I fall.” Plan to fall. I cannot count how many times I came close, wind-milling arms and airborne and all. Somehow I did not fall once. I’m sure next year I’ll fall twice to compensate. I assume there’s an award for not falling? I’ll just lay here by the mailbox until it arrives since I’m still not so great at standing right now. I had run over 32 miles when I saw my family for the first time. I had no idea they were going to be there, and that was probably for the best. It would’ve been harder on me to know the whole day that my husband and an 8-, 7- and 5-year old were waiting for me to hurry up. They cheered, and there were brief hugs. Mark accidentally drank pickle juice instead of Mountain Dew, and then we were off again. Mark and I stuck it out for another few miles together, but then he couldn’t handle my trash talk and taunting, and encouraged me to go on, which I did. My family showed up at another four places before the finish line (I feel like my husband’s job for the day might have been harder than mine). One of the places they were was mile 40. Remember how excited I was about free alcohol? I have never been one to turn down free things, nor things that are alcohol. I did not take the free alcohol. I saw someone do a beer bong at 40. I also saw him regurgitate his beer. It was not the first time in my life that my choice not to drink was confirmed. However, it was the most important time. I also did not accept the free leg massage my family had offered me. I was 40 miles in and had 2:50 to get through the last 10 miles. However, my watch had quit (even my watch is too tired to go on!) so I didn’t know how close my running time was to the official clock time. My husband was computing the same math from earlier and telling me how much time I have and how much better a two-minute massage would be for me and I am near tears because I swear on my life, unless you’re running these mountains, you have no idea how steep they are. I was off, and I was scared. I was thinking of all the time I had wasted looking for a drop bag and while that’s really funny right now it was so not funny right then. The last five miles were spent with a couple named Heidi and Craig. They were excellent distractors and didn’t mind when I ran up on their heels because it kept me motivated. They also commended my time management at aid stations. Clearly they weren’t witnesses to The Great Drop Bag Debacle of 2016. Advice #4: There is cake and beer at Confusion Corner. Not only is there cake and beer on your final pass through here, it is acceptable to take your cake and run. It’s not even on a plate; you are expected to grab it with your hands and go. This was literally the pinnacle of my life. Getting married and having children are glorious events, but I have just run 48.5 miles and I am expected to eat cake with my hands. I also passed up free beer again. Clearly I was ill. I finished in 11:31. It appears my husband was correct and I could’ve stopped for another moment or two at mile 40, but I’m glad I didn’t. I already had spent way too much time thinking about the 11:16 finish I would have had if I hadn’t bothered packing a drop bag. I didn’t want to think about the two minutes I could’ve spent on a leg massage break. Let’s be honest,—that two minutes was not going to be the difference in my ability to easily get off a couch the next day. I don’t have a watch to confirm it, but I am fairly confident that last 1/10 of a mile was my fastest that day. I have never felt so supported by random strangers as I did when I came up that last hill to the finish and everyone was yelling and there were bells and someone had a giant squid on his head and it was all so beautiful. And somehow, because the Race Gods are good, a runner who I know and love happened to be the one to hand me a buckle at the finish. Not just any runner, a runner who has worked hard to get where she is and is currently struggling because of a forced rest period. I got to hug her after my 50 miles. I want to tell you to register for this race. It won’t be the easiest 50-mile race you can find, that’s for damn sure. But since the site crashed last year with so many people attempting to get in, you probably shouldn’t, because that would alter my chances of getting back in next year. Thank you, Ice Age. It was a damn good day. Now. Can someone show me how to get off a potty without a step that requires rolling onto the bathroom floor? Thanks Trisha, hillarious! I finished my 4th Ice Age this year in 9:44 and my first Ice Age was 11:40. So you did fabulous! So true about the pain and the joy, does anything else feel so real as overcoming a tough race to finish? Congratulations! Thanks for your writing also. You’re so right! And it wasn’t until someone else pointed it out that I even realized I mentioned running it again. Ever. What’s an accomplishment without a struggle?